SPRUCE CREEK, FL - This Saturday, the Spruce Creek Mavericks precision formation aerobatics went on a practice ride which was filmed by a camera fixed on the Number 3 airplane. 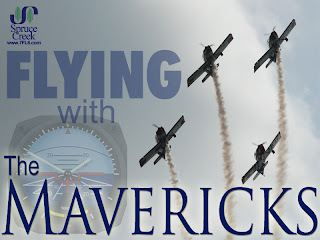 The Mavericks Team is composed of several former armed forces and civilian airline pilots that have thousands of hours of experience and enjoy the challenges of precision aerobatics. Based at the Spruce Creek Fly-In, they often donate their time to worthy causes and the delight of attendees at various air shows and events throughout Florida. They fly RV-8 aircraft built from kits manufactured by Van's Aircraft, the world's most successful experimental aircraft company. Flying Lead is our own Bob Gantt with Ron Keilin as #2, Mike Kelly as #3 and veteran Aerobatics Airshow performer, Gene McNeely at #4. Ride along with the Mavericks minus the sickness bag in this great video.